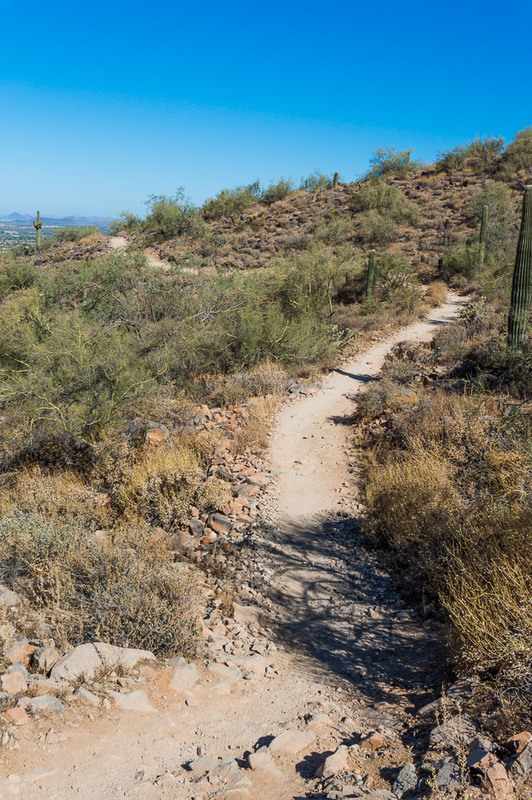 The Gateway Loop Trail at McDowell Sonoran Preserve is an impeccably maintained 4.5 mile trail that leads to an impressive and extensive trail system. The trail is built very well, but isn’t over groomed. The trail is on the edge of town and feels much more remote than most other trails in the greater Phoenix area. The signage on the trail system is second to none. It not only tells you what trail you are on, but also what trails are near by and exactly how far away they are. It’s almost too much information. 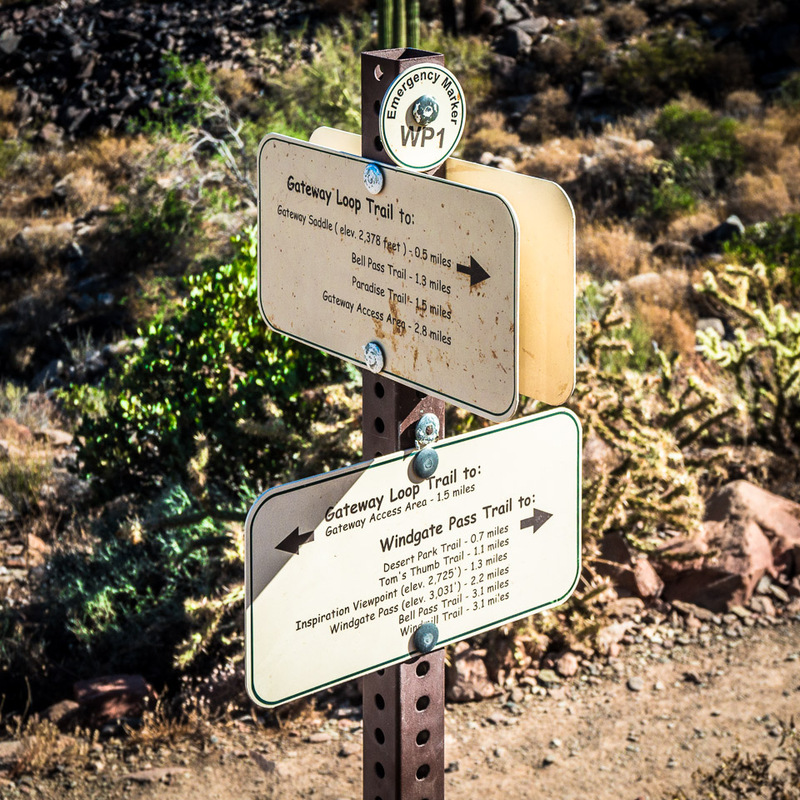 The trails at the McDowell Sonoran Preserve are first rate and the Gateway Loop is not only a great trail by itself, but as its name suggests, a gateway to a large an wonderful trail system. Go explore! More information about the park can be found at The McDowell Sonoran Conservancy website. The visitor’s center is a beautiful building with bathrooms that look like they were designed for a hotel. The steel and stone building is worth a visit on it’s own. Is this Scottsdale showing off? Yes, and they have succeeded, I’m impressed. They have created a truly memorable and noteworthy structure. Yes, it has toilets and water and parking and benches and shade and a scale model of the mountain. 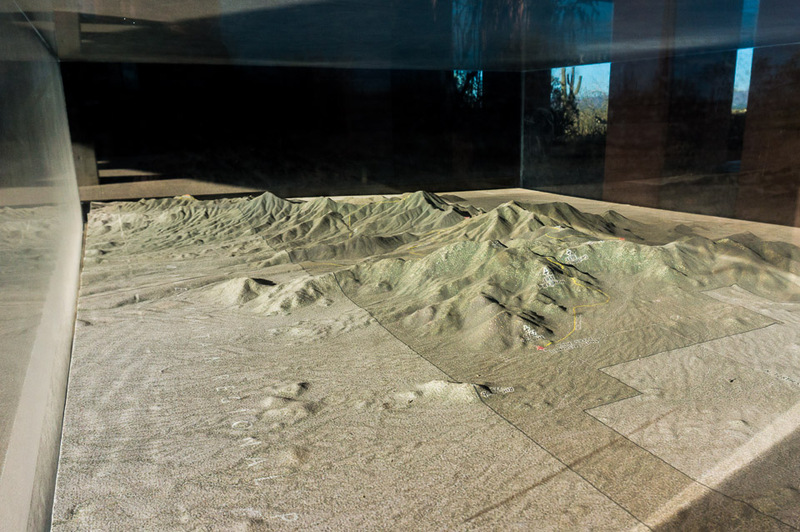 Yes, a scale model of the mountain. I really have no idea why. There is ample parking and though I’ve not seen it crowded, I imagine that it could fill up quickly when the weather is mild. The Bajada Nature Trail which starts at the visitor’s center is wheelchair and stroller accessible and if studded with informational exhibits. A detailed map with call-outs of elevation for each trail is a nice touch, but better still are the free printed trail maps at the visitor’s center. And just for good measure, there is also a (small) amphitheater. The Gateway Loop is a moderate level hike with easy smooth trails spiked now and again with gnarly rocky sections and a fair amount of elevation gain. The trail markers make it a breeze to stay on course and gives the confidence to explore other trails. It’s a pleasant and relatively isolated trail that makes for a great hike. There are some nice fast smooth sections which are routinely interrupted by very rocky sections that fluctuate between challenging and annoying. The Gateway Loop isn’t long enough for a satisfying ride. It does open up into many other trails that I will have to more fully explore before recommending. It’s still a fun trail and doing two laps may be enough to make it worth while. This entry was posted in Good Mountain Biking Trails, Great Hiking Trails, Hiking Trails, Moderate, Moderate, Mountain Biking Trails. Bookmark the permalink.